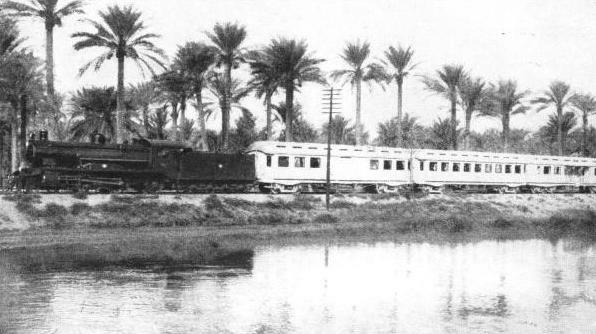 A PASSENGER TRAIN IN EGYPT. The first railway in Egypt and the first on the African continent was begun between Alexandria and Cairo in 1852 and opened throughout in 1856. To-day the State Railways have a system that possesses some 642 locomotives, 1,579 carriages 14,339 wagons, and numerous other vehicles. THE total area of Egypt proper, including the Libyan Desert, the region between the Nile and the Red Sea, and the Sinai Peninsula, is about 383,000 square miles. But the cultivated and settled area consists only of the long narrow Nile Valley and the triangular delta, a total area of about 12,400 square miles. Egypt’s historical importance need not be stressed in this chapter. The country has become a favourite winter resort of Europeans. Egypt was for many years an important part of the “overland route” to India and the East. This route was established in 1842. Mails, passengers, stores, and baggage were disembarked at Alexandria and carried across the desert to Suez. The P. & O. Company at one time owned 3,000 camels, which were employed on this service; the passengers, however, travelled in rough horse-drawn carriages. In 1851 the then Khedive of Egypt, Abbas I, anxious to encourage traffic by this important overland route, entered into negotiations with Robert Stephenson for the construction of a railway from Alexandria to Cairo. This was the first railway on the African continent, and the first section begun in 1852, was opened to Kafr-el-Zayat in 1854; a further section throughout to Cairo was opened two years latter. This length of 120 miles involved the construction of two bridges over the Nile, one at Kafr-el-Zayat and one at Benha. Before the construction of the former bridge through traffic was ferried across the river to Cairo. From Cairo the railway was carried on to Suez, thus completing the overland route by rail. Until the opening of the Suez canal in 1869 it was a source of considerable revenue to the Egyptian State Exchequer. The line from Cairo southwards was next undertaken; by 1874 it was completed as far Assiut, a large town on the banks of the Nile, about 230 mile from Cairo. Luxor, 340 miles from Cairo, was reached in 1898, the Nile having been crossed again at Nag-Hamadi, a town between Assiut and Luxor. Kena, a town some miles north of Luxor, was the southern limit of the State Railway system, and the line from Kena to Aswan, or Assuan was built by the Kena-Aswan Railway Company, a private enterprise. The section between Kena and Luxor was built to the standard gauge, and that between Luxor and Aswan to a gauge of 3 ft 6-in. The Luxor-Aswan line was connected with a narrow-gauge line from Aswan to Shellal. which had been constructed in 1884 as a military line during the first Sudan campaign to accelerate transport of military stores past the First Cataract. 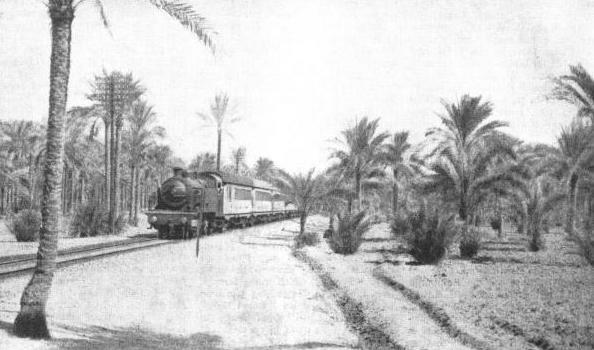 In 1898, at the close of the final Sudan campaign, the railway from Luxor to Shellal was absorbed into the State railway system. It was converted to standard gauge in 1926. Beyond Shellal to the limit of Egyptian territory at Wadi-Halfa, about 200 miles farther the country is desert, with innumerable valleys separated from one another by granite ridges running at right angles to the route which the railway would have to follow, thus making railway construction on this length too difficult and too costly to be practicable. THE EGYPTIAN STATE RAILWAYS own some 2,195 miles of standard gauge track, and a number of auxiliary lines. The State Railways are linked with the Egyptian Delta Light Railways, a narrow-gauge system of about 620 miles serving the Nile Delta. The policy of the State Railways Administration has been the gradual absorption of private lines in Lower Egypt. The Heluan Railway was built between 1870 and 1872 by the Khedive of that time, Ismail Pasha. It was operated as a State railway until 1888, when a working concession was granted to Suares Frères; the line was subsequently transferred to the Delta Light Railway Company. In 1914 the Government resumed working of the railway. The Mariut Railway was originally constructed and worked by the Khedive, Abbas Hilmi, as his private property; it extends from Wardian to Abu Hagag (148 miles), part being standard and part narrow gauge. It was purchased by the Government in 1914. During the war of 1914-18 part of the track was removed for military purposes. 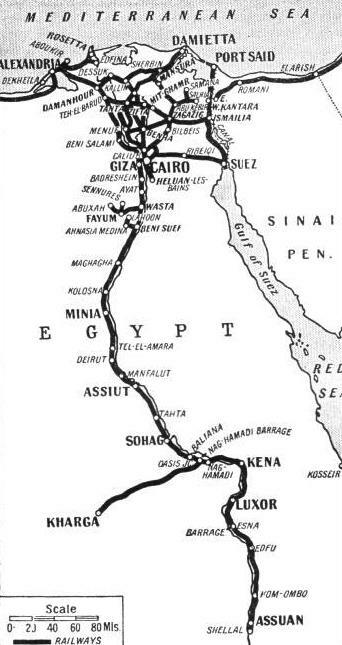 During the war the question of rail connection between Egypt and Palestine arose. In 1915 a standard gauge line for military purposes, running east from Kantara East, was begun. By the end of 1918 it was completed as far as Haita. Until 1917 a train ferry was used for the exchange of rolling stock between the Egyptian State Railways and the military railways of Palestine over the Suez Canal. But, in view of the need for more speedy transit between Egypt and Palestine, the Suez Canal Company agreed to the building of a swing bridge across the canal at a point three miles north of Kantara, on condition that it was removed after the war. The bridge was built in five months, and opened in July, 1918. Interchange of wagons and through bookings of goods traffic between Egypt and Palestine is still carried on by train ferry service across the canal, the tonnage of goods amounting to a very large annual total. Goods can be put on trucks at any station on the Egyptian State Railways and unloaded at any station on the Palestine Railways. There is a system of controlling the rolling stock exchanged, and, if trucks of one system are delayed on the other system beyond the allowed period, demurrage is enforced. From a railway point of view Egypt offered an ideal field for exploitation. Construction was easy and economical, almost the only major works being the Nile bridges. Gradients are practically non-existent and curves are easy. The route mileage of the State Railways is 2,195 miles of standard gauge, 244 miles of 3 ft 6-in gauge, and 121 miles of 2 ft 6-in gauge. The track was originally laid with light double-head and bull-head rails on wooden sleepers, but with a proportion of cast iron sleepers. MIXED TRAFFIC LOCOMOTIVE built for the Egyptian State Railways by the North British Locomotive Company, Ltd. This 2-6-0 engine has cylinders 21-in by 26-in and coupled wheels 5 ft 6¾-in diameter. The boiler pressure is 160 lb per sq in, total heating surface 1,909 sq ft and tractive effort 20,610 lb. The weight of the engine, in working order, is 66 tons 18 cwt, and the weight of the tender loaded is 57 tons 15 cwt. Increase in weight and speed of traffic led to the adoption of heavier rails, and in 1912 the Vignoles (flat-bottomed) type of 95 lb section was adopted as standard. Cast iron sleepers were abandoned, plenty of timber being obtainable, and there being no white ants to contend with. The wood which has been most satisfactory for sleepers is Turkish pine, but oak, jarrah, beech, and Oregon pine have been employed as well. The rails are supported on the sleepers by saddle plates, and held in place by screw spikes. About 250 miles of track are laid on steel sleepers of a trough pattern, to which the rail is secured by clips and bolts. The ballast used is flint gravel, which is obtainable in the country in large quantities. Between 1925 and 1932 the track underwent extensive renewal. 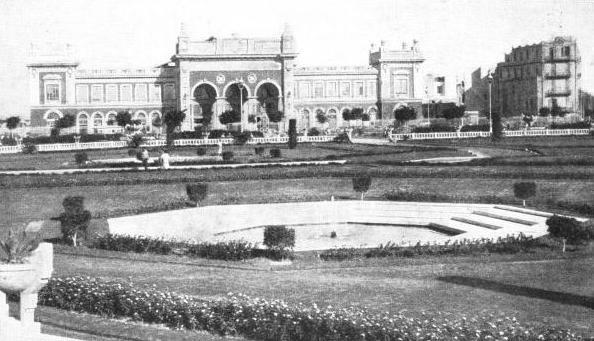 During the war it had deteriorated, as maintenance and renewal had been suspended because all available material and labour were required for military purposes, The central permanent way shops are at Gabbary (Alexandria), where they are conveniently placed for the reception of materials from abroad. The signalling employed is absolute lock and block similar to that in England. In general it is mechanical, both Tyers and Sykes’ block instruments being used, but at Cairo Main Station the Westinghouse electro-pneumatic system is in operation. A programme of interlocking, begun in 1900, has been continuously followed except during the war years and immediately after, and some 500 signal-boxes with interlocking gear have been brought into use. The installation at Cairo Station has been renewed on up-to-date lines in recent years, and now includes point detection, track circuiting, and illuminated diagrams in the signal boxes. Single lines are worked by electric staff and a type of staff-exchanging apparatus suitable for local conditions has been evolved. Long section staff working has been installed on the Luxor-Shellal section, a distance of 136 miles, with nineteen stations. The central signal workshops are situated in Cairo, and comprise a modern installation capable of dealing with all ordinary signal maintenance and repairs and a certain amount of manufacturing. There are nine railway bridges over the Nile, the most important being the Embaba Bridge. This bridge was renewed in 1924, and carries a double line of rails and a roadway on either side, with foot ways above. It has six fixed spans and one swing span, and the total length is 1,608 ft. The swing span can be operated electrically or by hand. The Dessouk Bridge is a single line bridge over the Rosetta branch of the Nile, and was opened in 1927. This bridge is in two sections joining a centre island, one section having a swing and five fixed spans and the other four fixed spans. There is a roadway on either side of the bridge. The number of locomotives possessed by the Egyptian State Railways is over 600, all of which have been built abroad; but many are over thirty years old and are gradually being replaced by more modern engines. The principal locomotive and carriage shops are at Bulak, Cairo, but they are now being transferred to Abu-Zaabal, about seventeen miles from the city. ALEXANDRIA STATION. Between this station and Cairo there are seven express trains operating daily in either direction The journey of 120 miles is covered in from two and a half to three and a quarter hours. Apart from the large volume of passenger traffic arriving at and departing from the city. Alexandria has the largest goods station In Egypt. There are four locomotive districts - Cairo, Alexandria, Lower Egypt, and Upper Egypt. The Cairo District works the express service of Lower Egypt with “Atlantic” type locomotives and the Cairo suburban, traffic with 2-6-2 type tank engines. A new running shed at Tanta operates all the principal provincial services of Lower Egypt. Although the building of locomotives is not undertaken in the locomotive shops, a considerable amount of rebuilding is carried on, and modern methods are employed. Oxyacetylene and arc-welding have been introduced, and their use extended in various directions. Spray painting of steel rolling stock and of locomotives is also being introduced. Experiments with a steam rail-car in 1926 led to the acquisition of many examples of this type of vehicle. Carriages number nearly 1,600 and goods wagons 14,300, with 650 miscellaneous vehicles. The carriages are all-steel bogie stock with elliptical roofs which have been found suited to Egyptian requirements. In 1931 gas lighting of passenger vehicles was abolished, and all stock is now electrically lighted. Roller bearings also are taking the place of the standard brass bearings, Goods wagons are mainly of the 10-tons box type, and, although there is a considerable amount of bogie stock the four-wheeled wagon seems to be preferred. All-steel stock is gradually replacing the wooden wagons. These are the first rail-cars in the world, it is understood, to be equipped with air conditioning plant. Each car is driven by a Ganz-Jendrassik 200 hp heavy oil engine with straight mechanical drive; it is 72 ft 2-in long, and accommodates seventy-one passengers. Some of these rail-cars will be used on the new railway between Cairo and Suez, which at present is used for goods traffic only. Cold water fountains are a feature of the interior equipment of the cars, an amenity that will be much appreciated by passengers in the summer on this new desert railway. Passengers carried on the Egyptian State Railways in the year 1933-34 numbered over thirty-four millions, as many being carried in one month as in a whole year fifty years ago. Trains are classified as expresses, semi-expresses, perishable, and goods. All express trains are formed of bogie corridor coaches. First-class coaches are divided into compartments which are fitted with electric reading lights. 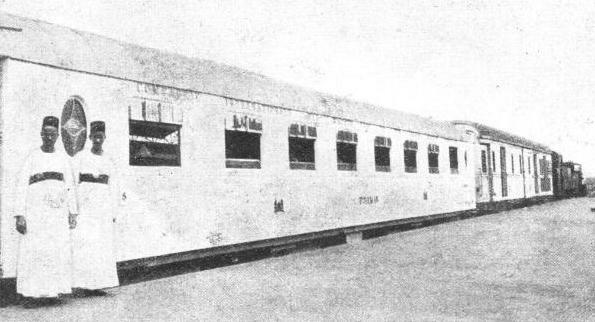 Restaurant, sleeping, and Pullman cars are attached to the principal trains. Large numbers of tourists are carried during the winter season, special trains being run to and from the quays at Alexandria for their conveyance. Luxurious liners leave Europe for Egypt several times a week, and giant multi-engined air liners also arrive regularly at the port of Alexandria. The “Taurus Express” reaches Cairo by way of the Balkans, Anatolia, Syria, and Palestine. A through service is provided by this train between London, Paris and Cairo, involving only three principal changes beyond the English Channel, namely, the crossing of the Bosporus at Istanbul, road transport between Tripoli and Haifa, and the crossing of the Suez Canal at Kantara. LUXURY COACHES for special functions and state occasions are maintained by the Egyptian State Railways. This picture shows the train used by the King of Egypt and his suite. On the platform of the imposing station at Cairo waits a crowd which is an amazing medley of types and variety of costume, with hotel-porters in plenty, looking for their patrons. The fine hotels of Cairo are world-famous, and on the terrace of more than one, an elegant and cosmopolitan crowd sits basking in a February sun, and shivering pleasantly at the thought of the snow and frost left behind in Europe. In the modern quarters of Cairo, the wide streets, in which, the traffic is controlled by white-uniformed “shawishes”, are lined on either side with trees and fine buildings, while gardens and monuments adorn the squares, giving the city the air of a great metropolis. Seen from the Pyramids across the green strip of the Nile Valley, Cairo seems to be dominated by the pointed silhouette of the Citadel among a sea of roofs, domes, and minarets. In the Musky, or bazaars, of Cairo is to be found a collection of glassware, copper, gold, carpets, beads, shawls, and perfumes, whose heady scent mixes with the aroma of coffee and cigarettes and with that of the frying confections from neighbouring restaurants. The “Sunshine Express”, a luxury train composed of restaurant and sleeping cars, takes passengers to Upper Egypt in a single night, and Abydos, Dendera, Thebes, Karnak. Luxor, Edfu, and Aswan soon become so many familiar names. Combined tickets between Cairo, Luxor, Aswan, and Shellal, including fares and sleeper and hotel accommodation, are issued at cheap rates during certain months. There are three trains a day in either direction between Cairo and Luxor, the journey of 340 miles taking about twelve hours. To Aswan and Shellal, there are two trains a day in either direction which cover the distance of 480 miles in about seventeen hours. THIRTY-FOUR MILLION PASSENGERS were carried on the Egyptian State Railways in 1933-1934. The carriages total nearly 1,600, and are mostly of all-steel bogie stock. The International Sleeping Car Company has also a large number of first-class coaches on express trains. All passenger stock is lighted by electricity. At Aswan the aspect of the country changes considerably. From the garden of the Cataract Hotel may be seen here and there, smoothed by the action of the water, the first blocks of that black stone whose high walls are soon to be seen enclosing the Nile as in a corridor. Beyond are the rapids leading up to the great Dam which now controls the waters of the Nile; when it lets them accumulate they rise above the temples of the island of Philæ; but when the sluices are opened the waters subside, leaving the island to glisten in the sun. Then comes the Sudan with its beehive huts, big game, vast deserts, swamps, and equatorial forests. Between Alexandria and Cairo there are seven express trains a day in either direction, taking from two and a half to three and a quarter hours for the journey of 120 miles. Greater first-class comfort is being provided, and Pullman cars at present in limited use, are to be substituted in future for first-class coaches; but, as a rule, the ordinary first-class fare only will be charged. When. the cars are on fast or on luxury trains, a supplement will be added. The Pullman stock of twelve cars at present in Egypt will have to be augmented, but meanwhile the cars already existing will be fitted with air-conditioning plant. 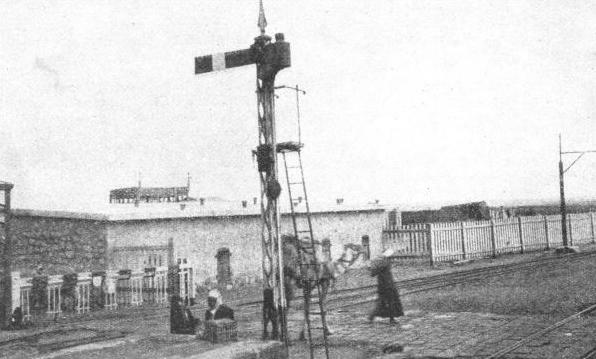 A LEVEL-CROSSING IN EGYPT. The signalling on the State Railways is the lock and block system. It is mostly mechanical, but at Cairo Main Station the Westinghouse electro-pneumatic system has been introduced. There are some 500 signal-boxes with interlocking gear. Staff working is employed on local lines. An indication of the popularising of railway travel in Egypt is found in the running in the spring of 1935 of two excursion trains which left Cairo for an unknown destination. Some 2,100 passengers travelled on the trains, and so popular was the idea that about 3,000 intending passengers were turned away. The trains ran to lsmailia, a distance of ninety-eight miles, and the fare charged was sixteen piastres (3s. 2½d.). The Main Station in Cairo is the largest passenger station in Egypt. It has nine platforms, with a total length of 2,180 yards, and deals with over 10,000 passengers daily. The station is worked from four signal-boxes, of which three are electro-pneumatically operated. There are also two suburban stations, at Pont Limoun and Bab-el-Luk, the former for the Matariya Line and the latter for Heluan-les-Bains; these deal with 160 trains daily. In a recent report made by Sir Felix Pole, formerly General Manager of the Great Western Railway, to the Egyptian Minister of Communications, the immediate electrification of the Cairo-Heluan line was recommended ; to be followed by electrification of the Cairo-Matariya line, and the building of a rail connection across Cairo between the two lines by tunnel, tube, or elevated railway. Goods traffic for the year 1933-34 totalled over seven and a quarter million tons, about seventy per cent of which consisted of cotton, cotton-seed, manure, coal, oil, cereals, building materials, timber, rice, and sugar. Gabbary (Alexandria) is the largest goods station, and deals with over two and a half million tons of goods annually. This is handled in two large central sheds of the most modern type. A modern marshalling yard with 250 sidings can deal with over 2,000 wagons every twenty-four hours. A Traffic Train Control Office, equipped with a complete system of telephone control, was established at Assiut in 1926 to regulate the traffic of the Mallawi-Assiut section. The results were found to be so satisfactory that train control has been extended to other parts of the system. The Egyptian State Railways are organised on the departmental system, controlled by a Supreme Railway Board under the presidency of the Minister of Communications. The members of the Board consist of some of the highest officials in the land. The General Manager, at the time of writing, is H. E. Mahmoud Shaker Bey, and the heads of the various departments are directly responsible to him. The total strength of the staff of the Egyptian State Railways is approximately 33,000, which includes the staff of the Egyptian Telegraph and Telephone Service. An Inspector-General of Telegraphs and Telephones controls the latter service under the General Manager of the State Railway. The lnspector-General is a permanent official of the British Civil Service (Post Office), and his services, as well as those of his technical staff, are lent to the Egyptian Government. Future prospects of the Egyptian State Railways are bright. Traffic is increasing, and the earnings for the last two or three years have been satisfactory. Suburban traffic in and around Cairo is heavy and, with the electrification of the Heluan and Matariya lines, should develop still further. In the past the only competitor was the river, which was not able to do much either in volume or in speed. More as a means of counteracting competition than with a view to traffic development, services by road and water were inaugurated by the State Railways in 1930-31. About forty buses are operated from Cairo to Benha, Bagour, and Badrashein, and the services are self-supporting. The river transport service consists of six steamers, twelve barges and sixteen pontoons. 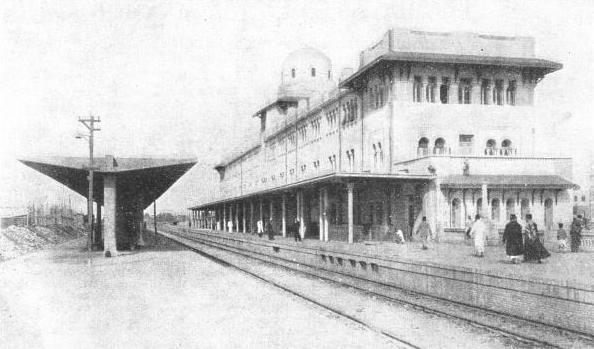 AN ORIENTAL ASPECT is presented by this station, Tanta, on the main line between Alexandria and Cairo. Tanta is an important junction. You can read more on “In Northern Africa”, “International Sleeping Cars” and “Railways in Palestine” on this website.